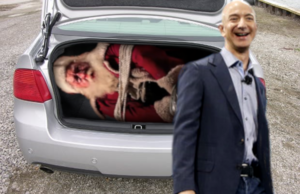 NEW YORK, NEW YORK – Jeff Bezos, CEO of internet retail giant Amazon, was caught by surveillance footage stuffing an old man in a red coat inside the trunk of his car on Monday, around 7:40 AM EST. Footage of the incident (which occurred just outside the site of the soon to be built Amazon HQ2 in Long Island City) shows Bezos subduing and hogtying the oddly dressed bearded fellow, before driving to Queensbridge Park and dumping the man's body into the East River. Bezos was briefly detained by the NYPD in connection to the crime he had committed, but following a pleasant chat and a modest donation to the NYPD Pipes and Drums, Bezos was released and fined $25 for littering. The Police Commissioner stated, "It's just one of those things, you know? The things you things and stuff, and? Yes. Indeed, so." Hours later, Bezos revealed that Amazon was testing out a proprietary delivery service called Prime Sleigh: customer orders are delivered instantly using a teleporting sleigh pulled by a team of eight, seemingly magical, reindeer, including one with a glowing nose and two missing eyes. NOAA satellites also detected traces of radioactive decay, consistent with thermonuclear detonation, over several spots north of the Polar Circle. This page was last edited on 16 December 2018, at 15:38.